“Ephesians is an epistle for all the world, for Jew and Gentile, for husband and wife, for parent and child, for master and servant. It was the mind and will of God in Paul’s day; it is the voice of inspiration in our day; it is an epistle of universal appeal and application. “… It contains some of Paul’s best writing, and is a document that deals with fundamentals, with the gospel of God in all its saving glory” (Bruce R. McConkie, Doctrinal New Testament Commentary, 3 vols. [1965–73], 2:489). The Epistle to the Ephesians reflects great depth in its teachings. Paul’s main theme in this epistle can perhaps best be summarized as the setting aside of the things of this world in order to grow in spiritual knowledge and partake of the unity and fellowship of the Church. In the pages of Ephesians, members of The Church of Jesus Christ of Latter-day Saints will find many familiar teachings and practices that characterize the Lord’s true Church in every age. The Epistle to the Ephesians states that its author was the Apostle Paul (see Ephesians 1:1), and Paul’s authorship was accepted by many early Christians. 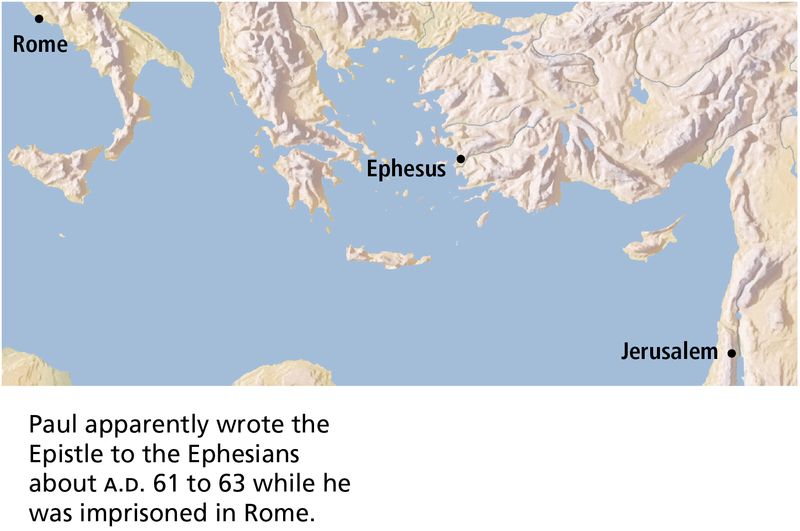 When and where was Ephesians written? Paul stated that he was a prisoner at the time he wrote the Epistle to the Ephesians (see Ephesians 3:1; 4:1; 6:20), so Ephesians may have been written during Paul’s first imprisonment in Rome, around A.D. 61 to 63, and perhaps at the same time he wrote the Epistle to Philemon and the Epistle to the Colossians (which bear many similarities to Ephesians). During this time Paul was being held under house arrest, but he had the freedom to receive visitors and teach the gospel (see Acts 28:16–31). To whom was Ephesians written and why? In the King James Version, Ephesians 1:1 states that the Epistle to the Ephesians is addressed “to the saints which are at Ephesus”; however, the earliest manuscripts of Ephesians do not contain the words “which are at Ephesus.” This means that Paul may not have written the epistle specifically to the Ephesians but to several congregations of Saints, including those in Ephesus. Ephesus served as Paul’s headquarters during his third missionary journey (see Acts 19:9–10; 20:31), and he had great affection for these people (see Acts 20:17, 34–38). In his letter Paul addressed Gentile members of the Church (see Ephesians 2:11) who were perhaps recent converts (see Ephesians 1:15). He wrote to expand the spiritual horizons of those who were already members. His main purposes were to help these converts grow in their spiritual knowledge of God and the Church (see Ephesians 1:15–18; 3:14–19); to promote unity, particularly between Gentile and Jewish Saints (see Ephesians 2:11–22; 4:1–16; 5:19–6:9); and to encourage the Saints to withstand the powers of evil (see Ephesians 4:17–5:18; 6:10–18). Many Saints in Ephesus were living righteously enough to be sealed up to eternal life (see Ephesians 1:13). Following Peter’s death, John the Revelator became the presiding authority of the Church, and when John moved from Jerusalem to Ephesus, the headquarters of the Church also moved to Ephesus. According to Christian tradition, Mary, the mother of Jesus, spent the remaining years of her life at Ephesus under John’s care (see John 19:27). Ephesus was the first of the seven cities that John wrote to in the book of Revelation (see Revelation 2:1–7). What are some distinctive features of Ephesians? Ephesians contains many teachings and ideas that are familiar to Latter-day Saints, including foreordination, the dispensation of the fulness of times, the Holy Spirit of Promise, the importance of prophets and apostles, the idea of one true and unified Church, and the various callings and functions within the organization of the Church. This letter also contains some of the most sublime teachings on the family that are found anywhere in scripture. Paul wrote of the Saints’ foreordination to receive the gospel, sealing by the Holy Spirit of Promise, salvation by grace, the unifying of Gentile and Jewish Saints in the Church, the purpose of the Church, and the Church’s organization upon a foundation of prophets and apostles, with Jesus Christ as the chief cornerstone. God will gather all things together in Christ in the dispensation of the fulness of times. Paul encouraged the Saints to apply true doctrine in their daily lives. He encouraged them to put off the old man (their former sins) and put on Christ. He gave counsel to wives, husbands, children, parents, servants, masters, and congregations. He encouraged Saints to “put on the whole armour of God” (Ephesians 6:11). In his Epistle to the Ephesians, Paul frequently referred to Church members as “saints.” According to the Bible Dictionary, “saint is a translation of a Greek word also rendered ‘holy,’ the fundamental idea being that of consecration or separation for a sacred purpose” (Bible Dictionary, “Saint”). By referring to members of the Church as Saints, Paul was teaching that every follower of Jesus Christ is made holy﻿—set apart from the world﻿—through the Atonement and should therefore strive to be a holy person. Ephesians contains the only passages in the New Testament that use the phrase translated as “heavenly places” to refer to multiple realms in heaven (see Ephesians 1:3, 20; 2:6; 3:10). In the latter days, the Lord revealed that heaven consists of three realms (see D&C 76:50–112; 88:14–47). Elsewhere Paul wrote about varying degrees of resurrected glory (see 1 Corinthians 15:40–42) and about his experience of being “caught up to the third heaven” (2 Corinthians 12:2). In Ephesians 1:4–5, 11, Paul taught that before the world was created, members of the Church were chosen by God to receive the gospel on earth. This and other New Testament passages support the doctrine of premortal existence (see John 9:2; Romans 8:29; 1 Peter 1:2). The word predestinated (Ephesians 1:5, 11) means “appointed beforehand” or “foreordained.” Foreordained blessings are not unconditionally guaranteed but are dependent upon the righteous exercise of agency in this life (see Alma 13:2–3; the commentary for Romans 8:29–30). Paul taught that those who attain exaltation were predestinated to do so by being “adopted” by God (see Ephesians 1:5), thereby becoming His heirs and receiving an “inheritance” of eternal life (Ephesians 1:11). Jesus Christ is God’s only rightful heir. Therefore, to receive eternal life, we must be adopted through the redeeming blood of Jesus Christ in order to become “heirs of God, and joint-heirs with Christ” (Romans 8:17). Paul taught that grace, the enabling power to be exalted, is extended by God the Father through His Beloved Son, and it is only through the blood of Jesus Christ that redemption comes. Ephesians 1:9–10; 3:3–6. What Is Meant by the Term “Mystery of His Will”? The term “mystery of his will” refers to God’s plans that a person can discover and understand only as they are revealed by God Himself. Paul was apparently speaking of the plan of salvation, a mystery to the world during times of apostasy. Paul indicated that the “mystery of Christ” (Ephesians 3:4) is that the “Gentiles should be fellowheirs” and equal partakers of the gospel of Jesus Christ (Ephesians 3:6), an important part of the plan of salvation. A still image from the film The First Vision. With the appearance of God the Father and Jesus Christ to the boy Joseph Smith, the dispensation of the fulness of times was opened. Paul taught that God would “gather together in one all things in Christ” during the dispensation of the fulness of times (Ephesians 1:10). The Bible Dictionary teaches: “A dispensation of the gospel is a period of time in which the Lord has at least one authorized servant on the earth who bears the holy priesthood and the keys, and who has a divine commission to dispense the gospel to the inhabitants of the earth. When this occurs, the gospel is revealed anew so that people of that dispensation do not have to depend basically on past dispensations for knowledge of the plan of salvation. There have been many gospel dispensations since the beginning. The Bible suggests at least one dispensation identified with Adam, another with Enoch, another with Noah, and so on with Abraham, Moses, and Jesus with His Apostles in the meridian of time” (Bible Dictionary, “Dispensations”; see also D&C 112:30; 128:18, 20). The dispensation of the fulness of times is a period of restoration and fulfillment of all the plans, purposes, and promises that God has revealed since the world began. It “will bring to light the things that have been revealed in all former dispensations; also other things that have not been before revealed. He shall send Elijah, the Prophet, etc., and restore all things in Christ” ( Teachings of Presidents of the Church: Joseph Smith , 510–11). According to the Doctrine and Covenants, “it is necessary in the ushering in of the dispensation of the fulness of times, which dispensation is now beginning to usher in, that a whole and complete and perfect union, and welding together of dispensations, and keys, and powers, and glories should take place, and be revealed from the days of Adam even to the present time” (D&C 128:18). The dispensation of the fulness of times is the final dispensation, which will prepare the earth for the Second Coming of Jesus Christ. Fulness of Times, by Greg Olsen. During the dispensation of the fulness of times, the Lord will gather together in one all of the keys of previous gospel dispensations (see Ephesians 1:10). Elder B. H. Roberts (1857–1933) of the Seventy taught: “This is the dispensation of the fullness of times, and we see running into it, as mighty streams rush into the ocean, all the former dispensations, putting us in touch with them, putting them in touch with us; and we see that God has had but one great purpose in view from the beginning, and that has been the salvation of His children. And now has come the final day, the final dispensation, when truth and light and righteousness must flood the earth” (in Conference Report, Oct. 1904, 73; see also D&C 27:13; 121:26–27; 124:41; 128:18–21). The Holy Spirit of Promise is another name for the Holy Ghost. It is used in reference to the sealing and ratifying power of the Holy Ghost (see D&C 76:53; 132:7). “The Holy Spirit of Promise … confirms as acceptable to God the righteous acts, ordinances, and covenants of men. The Holy Spirit of Promise witnesses to the Father that the saving ordinances have been performed properly and that the covenants associated with them have been kept. “They who are sealed by the Holy Spirit of Promise receive all that the Father has [see Eph. 1:13–14; D&C 76:51–60]. “All covenants and performances must be sealed by the Holy Spirit of Promise to have force after this life [see D&C 132:7, 18–19, 26]” (Guide to the Scriptures, “Holy Spirit of Promise”; scriptures.lds.org). When Paul wrote that the Saints had been “sealed with that holy Spirit of promise” (Ephesians 1:13), he meant that they had been promised eternal life even though they were still living in mortality. When people are sealed by the Holy Spirit of Promise, the Holy Ghost ratifies them as celestial inheritors even though they are mortal. This doctrine is sometimes referred to as having one’s calling and election made sure or receiving the Second Comforter (see 2 Peter 1:4–19; D&C 132:6–7; Bruce R. McConkie, Doctrinal New Testament Commentary, 2:493–95; History of the Church, 3:379–80). Paul taught that the gift of the Holy Ghost is “the earnest of our inheritance” (Ephesians 1:14). The word earnest here means “a token of what is to come” (see the commentary for 2 Corinthians 1:22; 5:5). In other words, “this gift [of the Holy Ghost] is a foretaste of eternal joy and a promise of eternal life” ( Preach My Gospel: A Guide to Missionary Service , 65). The gifts of the Spirit also act as a foretaste of the eternal rewards that await the faithful in the next life. We are the “purchased possession” that is bought by the atoning blood of Jesus Christ (Ephesians 1:14; see also 1 Corinthians 6:20; 1 Peter 1:18–19). Just as someone buying a piece of property often makes a token payment (sometimes called earnest money in the financial world) to indicate that he or she is acting in good faith and intends to complete the purchase, God gives us the gift of the Holy Ghost and its attendant peace to assure us that He will ultimately reward us with redemption and exaltation as we live faithfully. Our obedience to God’s commandments and ordinances is the way we show God that we desire to receive the blessings of exaltation that He offers to us. What do you learn from these verses about the glory and status of Jesus Christ? According to verse 22, what is Jesus Christ’s role in the Church? In Ephesians 2:8–10, Paul discussed the relationship between grace, faith, and good works. Ultimately, salvation comes through the merits of Jesus Christ’s work, not on our own. Paul called followers of Jesus Christ “[God’s] workmanship, created in Christ Jesus unto good works” (Ephesians 2:10). This places emphasis on the Lord’s work rather than on our own and teaches that our ability to perform good works stems from the change that the grace of Jesus Christ causes to take place within us when we turn to Him in faith (see also 1 Corinthians 15:10 and Philippians 2:13). Paul taught that we are not saved by either faith or works alone, as both are critical to salvation. Faith and works empower us to receive the merciful blessings of the Atonement of Jesus Christ. For more information on the subject of grace, see the commentary for Romans 3:23–24 and for Romans 4:4, 16; 5:2, 15–21; 6:1–2, 14–15. “Men are thus saved by grace alone, in the sense of being resurrected; they are saved by grace coupled with obedience, in the sense of gaining eternal life. The gospel plan is to save men in the celestial kingdom, and hence Paul teaches salvation by grace through faith, through obedience, through accepting Christ, through keeping the commandments. Thus Nephi writes, ‘Be reconciled to God; for we know that it is by grace that we are saved, after all we can do’ (2 Ne. 25:23), and Moroni records, ‘Come unto Christ, and be perfected in him, and deny yourselves of all ungodliness; and if ye shall deny yourselves of all ungodliness and love God with all your might, mind and strength, then is his grace sufficient for you, that by his grace ye may be perfect in Christ.’ (Moro. 10:32. )” ( Doctrinal New Testament Commentary, 2:498–99). At the temple in Jerusalem, a partition wall was set up to prevent Gentiles from entering the courts that were forbidden to them. The temple in Jerusalem contained several courts or areas, and only certain types of people could enter each court. Gentiles were permitted to ascend the temple mount and enter the outer court, called the court of the Gentiles. The inner courts of the temple, however, were shielded from Gentile access by a special partition or wall that stood about one meter high. If a Gentile passed beyond this wall, he could be put to death. Archaeologists have discovered two of the marble blocks that made up this barrier, and they contain inscriptions in Greek and Latin that read: “No foreigner is to pass beyond the barriers surrounding the sanctuary. Whoever is caught doing so will have himself to blame for his death which will follow” (Richard Neitzel Holzapfel, Eric D. Huntsman, Thomas A. Wayment, Jesus Christ and the World of the New Testament , 160). Following Paul’s third missionary journey, some Jews in Jerusalem accused Paul of bringing Gentiles beyond the barrier, leading to a riot and ultimately to Paul’s arrest (see Acts 21:27–29; Numbers 1:51). In Ephesians 2:12–19, Paul spoke about the “wall of partition,” meaning the spiritual barrier that separated Jews from Gentiles and also separated Gentiles from God. These and all other barriers were removed by the Atonement of Jesus Christ. Gentiles who accepted the gospel were no longer to be regarded as aliens, strangers, and foreigners﻿—they were now of “the household of God,” part of God’s covenant people. By accepting the gospel of Jesus Christ through faith, repentance, baptism, and the gift of the Holy Ghost, both Jewish and Gentile members of the Church had access to God (see Ephesians 2:18). In modern times, we enjoy the same blessings when we are baptized and live worthily. The “walls” between us and the Lord are removed, and we gain full access to God’s blessings. We also become members of “the household of God” (Ephesians 2:19). What does this verse imply about the responsibility of members of the Church in our day toward those who are new converts or who move into our wards and branches? “Built upon the foundation of the apostles and prophets, Jesus Christ himself being the chief corner stone” (Ephesians 2:20). Paul compared the members of the Church to a building. Just as a building needs a strong foundation for strength and stability, the Church was “built upon the foundation of the apostles and prophets, Jesus Christ himself being the chief corner stone” (Ephesians 2:20). Elder Jeffrey R. Holland of the Quorum of the Twelve Apostles discussed why a foundation of apostles and prophets is critical to the Church: “The apostolic and prophetic foundation of the Church was to bless in all times, but especially in times of adversity or danger, times when we might feel like children, confused or disoriented, perhaps a little fearful, times in which the devious hand of men or the maliciousness of the devil would attempt to unsettle or mislead. … In New Testament times, in Book of Mormon times, and in modern times these officers form the foundation stones of the true Church, positioned around and gaining their strength from the chief cornerstone, ‘the rock of our Redeemer, who is [Jesus] Christ, the Son of God’ [Helaman 5:12]. … Such a foundation in Christ was and is always to be a protection in days ‘when the devil shall send forth his mighty winds, yea, his shafts in the whirlwind, yea, when all his hail and his mighty storm shall beat upon you’” (“Prophets, Seers, and Revelators,” Ensign or Liahona, Nov. 2004, 7). The Savior referred to Himself as the stone which the builders had rejected, which had become the “head of the corner” (Matthew 21:42), or in the words of Paul, the “chief corner stone.” A cornerstone is a massive stone that is laid at the corner of a foundation to give strength and stability to the entire structure. A cornerstone can also be used to connect two adjoining walls to form a corner. Paul used this imagery to explain that Jesus Christ provides strength and stability to the whole Church and that through Jesus Christ, Jewish and Gentile members of the Church are bound together (see Jacob 4:15–16; Psalm 118:22; Isaiah 28:16). All members become united, “fitly framed together [growing] unto an holy temple in the Lord.” All of this is made possible through the Atonement of Jesus Christ, who is the “chief corner stone” (Ephesians 2:20–21). Paul wrote about “the mystery of Christ” that had been revealed to him (Ephesians 3:4). Here mystery refers to a sacred truth made known by revelation. The mystery Paul wrote about is that both Jews and Gentiles can become heirs of the gospel covenant through Christ. This was a doctrine that “in other ages was not made known unto the sons of men” (see Ephesians 3:3–6). Paul taught that all those who follow Christ take upon themselves His name and become His seed and “heirs of the kingdom of God,” just as the Book of Mormon teaches (Mosiah 15:11; see also Mosiah 27:25; Ephesians 3:15; the commentary for Ephesians 1:9–10; 3:3–6). These teachings are evidence of Paul’s sincerity and humility (see Ephesians 3:8). His prayer for the Ephesian Saints was that Christ would “dwell in [their] hearts by faith” and that they would come to know the love of Christ (Ephesians 3:17). In Ephesians 3:11–12, Paul taught that through Jesus Christ and our faith in Him, we can “have boldness and access [to God] with confidence” (see also Ephesians 2:18). The word “boldness” can be understood as confidence in the presence of God. Because of the Savior, in this life we can freely approach God the Father through prayer in the name of Jesus Christ, and in the next life we can enter God’s presence with confidence (see Hebrews 4:16). What do these verses teach about God’s power? How does this truth affect your willingness to trust in Him? The word “one” appears seven times in Ephesians 4:4–6. Oneness and unity are important themes in Ephesians and in Paul’s other writings. Paul constantly preached about unity and prayed for unity among Church members (see Romans 12:5; 1 Corinthians 1:10; 2 Corinthians 13:11). In modern times, the Lord revealed to Joseph Smith that unity is a key law of the celestial kingdom (see D&C 105:3–5). There is only one true Lord, one true faith, one true baptism, and one true Father of all. “… As long as they remained on the earth, functioning under the authority Jesus gave them, unity of doctrine and uniformity of the ordinances prevailed. The gospel message, which they were commanded to take to all the world, was the same to everyone everywhere. People were not taught different gospels and then given a choice. There was only one plan for all. “One church, one authorized ministry, one orthodox gospel doctrine, and one Holy Ghost characterized the church of Jesus Christ in His time. ‘For God is not the author of confusion, but of peace, as in all churches of the saints.’ (1 Cor. 14:33.) Thus God’s revelation to leaders of the Church of Jesus Christ was reasonable, consistent, and unified. “It was only after the death of Christ’s apostles that revelation ceased. The pure doctrines Christ taught became diluted with the philosophy of the world, and profane innovations appeared in the ordinances of the church. Eventually, that which had once been clear and understandable became mythical and confusing” (“What Constitutes the True Church,” Ensign, May 1977, 22). Paul said that when Jesus Christ ascended to heaven, “he led captivity captive” (Ephesians 4:8). Elder Bruce R. McConkie explained the meaning of this phrase: “[Jesus Christ] overcame death; all men were the captives of death until Christ captured the captivator and made death subject to him, or, as the Psalm from which Paul is quoting continues to say, ‘He that is our God is the God of salvation; and unto God the Lord belong the issues from death.’ (Ps. 68:20. )” ( Doctrinal New Testament Commentary, 2:509). Ephesians 4:11. What Are Evangelists and Pastors? Paul listed the offices of evangelist and pastor as part of the organizational structure of the Church (see Ephesians 4:11). An evangelist is “one who bears or proclaims the good news of the gospel of Jesus Christ” (Guide to the Scriptures, “Evangelist”; scriptures.lds.org). In latter-day revelation, patriarchs are described as being “evangelical ministers” (D&C 107:39–41). The Prophet Joseph Smith (1805–44) taught, “An evangelist is a Patriarch. … Wherever the Church of Christ is established in the earth, there should be a Patriarch for the benefit of the posterity of the Saints, as it was with Jacob in giving his patriarchal blessing unto his sons” ( Teachings of Presidents of the Church: Joseph Smith , 140). A pastor is a shepherd or one who leads a flock﻿—a fitting description of modern-day bishops, branch presidents, and stake and district presidents (see 1 Peter 5:2–4). From Ephesians 4:11–16 we learn some of the purposes of the priesthood and its offices. Paul recognized that a “unity of the faith” cannot be reached without the presiding leadership of living Apostles and others. President Russell M. Nelson quoted Paul’s teachings on the unity of the faith and then explained: “The ministry of the Apostles﻿—the First Presidency and the Twelve﻿—is to bring about that unity of the faith and to proclaim our knowledge of the Master. Our ministry is to bless the lives of all who will learn and follow the ‘more excellent way’ of the Lord [1 Corinthians 12:31; Ether 12:11]. And we are to help people prepare for their potential salvation and exaltation” (“Salvation and Exaltation,” Ensign or Liahona, May 2008, 7–8). Elder D. Todd Christofferson of the Quorum of the Twelve Apostles similarly provided insight into the unifying role of Apostles: “In the Church today, just as anciently, establishing the doctrine of Christ or correcting doctrinal deviations is a matter of divine revelation to those the Lord endows with apostolic authority” (“The Doctrine of Christ,” Ensign or Liahona, May 2012, 86). Search these verses and identify the ways a disciple of Jesus Christ can “put off … the old man” and “put on the new man.” In what areas of your life do you feel you can more fully put off the old man and put on the new man? Paul’s counsel to “put off concerning the former conversation the old man” and to “put on the new man” (Ephesians 4:22, 24) used the imagery of setting aside old clothing and clothing oneself in righteousness. Paul devoted much of the rest of Ephesians to describing the Saints’ “former conversation,” meaning the unrighteous practices the Saints should abandon, and defining the higher, more saintly manner of living they should adopt. The Joseph Smith Translation of Ephesians 4:26 changes the confusing instruction “Be ye angry, and sin not” to the question “Can ye be angry, and not sin?” (in Ephesians 4:26, footnote a). This change brings this verse into harmony with Paul’s other teachings about anger, such as his counsel to “let all bitterness, and wrath, and anger … be put away from you” (Ephesians 4:31). “‘He made me mad.’ This is another phrase we hear, also implying lack of control or agency. This is a myth that must be debunked. No one makes us mad. Others don’t make us angry. There is no force involved. Becoming angry is a conscious choice, a decision; therefore, we can make the choice not to become angry. We choose!” (“Agency and Anger,” Ensign, May 1998, 80). Paul encouraged the Saints to avoid “corrupt communication,” which includes all forms of inappropriate speech: lying, deceit, vulgar or profane expressions, gossip, irreverent or disrespectful speech, and offensive, corrupt, degrading, belittling, or profane language, among others. Paul taught about how Christ had offered Himself as an offering and a sacrifice, thereby becoming a “sweetsmelling savour” (Ephesians 5:2). Elder Bruce R. McConkie taught: “Even as each sacrifice offered anciently, as it prefigured the coming sacrifice of the Lamb of God, was ‘a sweet savour … unto the Lord’ (Ex. 29:18), so was Christ’s offering of himself a pleasing thing to God. The sweet smell of the burning sacrifices in Israel symbolized the pleasing blessings flowing from our Lord’s personal offering” ( Doctrinal New Testament Commentary, 2:516). Ephesians 5:17–6:9 contains one of several New Testament “household codes,” which are sets of instructions to wives, husbands, children, parents, servants, and masters (see Colossians 3:16–4:2; Titus 2:1–10; 1 Peter 2:18–3:8; and the commentary for Colossians 3:18–4:2). The codes recorded in Ephesians and Colossians are both given in connection with instructions on congregational worship. Since the early congregations of the Church met to worship and partake of the sacrament in Church members’ homes, the congregations Paul addressed would have included all members of a typical Greco-Roman household﻿—fathers and husbands, mothers and wives, children, slaves, and masters. In the household setting, the well-being of house-church congregations was inseparable from the well-being of Christian families. In the household code found in Ephesians 5:21–6:9, interpersonal relationships are defined in terms of each person’s relationship with Christ. Paul said that wives should submit to their husbands “as unto the Lord” (5:22). Husbands are to love their wives “as Christ also loved the church, and gave himself for it” (5:25). Children should obey their parents “in the Lord” (6:1). Parents are instructed to raise their children “in the nurture and admonition of the Lord” (6:4). Slaves should serve their masters “as unto Christ” (6:5) and “as to the Lord” (6:7). Masters are to deal with their servants while remembering their “Master also is in heaven” (6:9). Paul’s words remind us that our relationship with Christ should guide and define our relationships with all others (see the commentary for Galatians 3:28–29). Paul taught that all members of the Church should submit themselves to one another, or in other words, place others ahead of themselves (see Ephesians 5:21). He then explained how the principle of submitting oneself applied in family and household relationships, starting with wives and husbands. For wives, this means submitting themselves to their husbands as they would to the Lord; for husbands, this means loving their wives as Christ loved the Church and gave Himself for it (see Ephesians 5:22, 25). If couples are truly united, then any sacrifice made on behalf of one’s spouse inevitably brings blessings to oneself; thus, “he that loveth his wife loveth himself” (Ephesians 5:28). President Gordon B. Hinckley (1910–2008) stated: “‘Happiness in marriage is not so much a matter of romance as it is an anxious concern for the comfort and well-being of one’s companion. Any man who will make his wife’s comfort his first concern will stay in love with her throughout their lives and through the eternity yet to come’ (Anchorage, Alaska, regional conference, 18 June 1995)” (“Speaking Today: Excerpts from Recent Addresses of President Gordon B. Hinckley,” Ensign, Apr. 1996, 72). Paul’s counsel that wives should submit to their husbands (see Ephesians 5:22) does not justify male dominion. People in Greco-Roman society regarded the father as being the head of the extended family and the absolute authority over the entire household. Therefore, Paul’s teachings represented a dramatic change to these traditional ideas because he defined husbands’ and fathers’ roles in terms of Christ’s love and sacrifice for the Church. “Christ loved the church and its people so much that he voluntarily endured persecution for them, suffered humiliating indignities for them, stoically withstood pain and physical abuse for them, and finally gave his precious life for them. “When the husband is ready to treat his household in that manner, not only the wife but all the family will respond to his leadership” (“Home: The Place to Save Society,” Ensign, Jan. 1975, 5). “The wife you choose will be your equal. Paul declared, ‘Neither is the man without the woman, neither the woman without the man, in the Lord’ (1 Cor. 11:11). “In the marriage companionship there is neither inferiority nor superiority. The woman does not walk ahead of the man; neither does the man walk ahead of the woman. They walk side by side as a son and daughter of God on an eternal journey. “I am confident that when we stand before the bar of God, there will be little mention of how much wealth we accumulated in life or of any honors which we may have achieved. But there will be searching questions concerning our domestic relations. And I am convinced that only those who have walked through life with love and respect and appreciation for their companions and children will receive from our eternal judge the words, ‘Well done, thou good and faithful servant: … enter thou into the joy of thy lord’ (Matt. 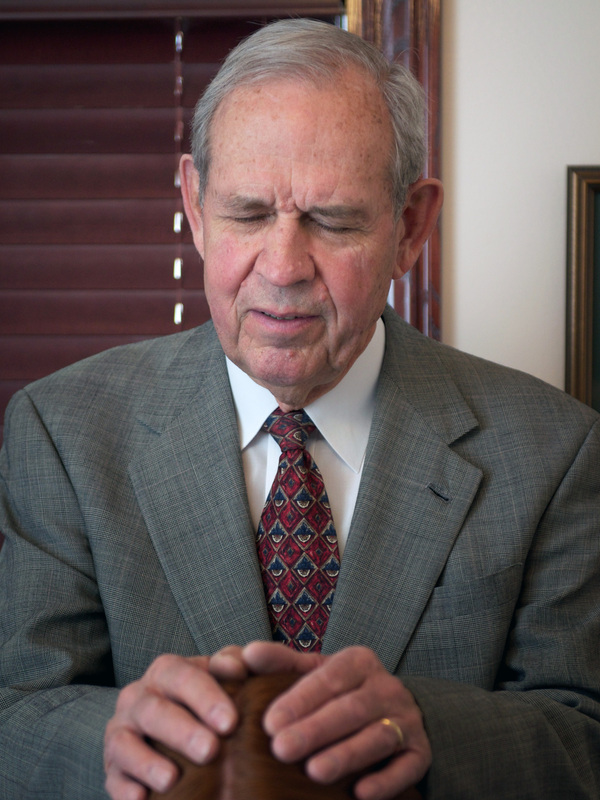 25:21)” (“Personal Worthiness to Exercise the Priesthood,” Ensign, May 2002, 53–54). As part of his counsel on family relationships, Paul reiterated the commandment that children should honor their parents (see Ephesians 6:1–3). In For the Strength of Youth, Church leaders identified some ways children can do this: “Honor your parents by showing love and respect for them. Obey them as they lead you in righteousness. Willingly help in your home. Participate in wholesome family activities and traditions. Join your family in family prayer, family scripture study, and family home evenings. Keeping these commandments strengthens and unifies families” ( For the Strength of Youth [booklet, 2011], 14–15). “There is no other thing in which we can have absolute assurance. There is no other foundation in life that can bring the same peace, joy, and hope. In uncertain and difficult times, faith is truly a spiritual gift worthy of our utmost efforts. We can give our children education, lessons, athletics, the arts, and material possessions, but if we do not give them faith in Christ, we have given little” (“Faith in the Lord Jesus Christ,” Ensign or Liahona, May 2009, 38). In New Testament times, slavery was a very common institution throughout the Roman Empire. Undoubtedly many Church members were either servants or had servants as part of their households. People became slaves by being captured in war, being sold to pay debts, or being kidnapped. Paul’s counsel about how servants should act (see Ephesians 6:5–8) does not imply that he approved of the institution of slavery, but it teaches members of the Church living in a culture with servants and masters how those relationships should be guided by the gospel of Jesus Christ. “We may take this to mean, in modern terms, that the servant and employee should consistently give honest service, full and complete, and do for his employer what he would want an employee to do for him if he himself were the employer” ( The Miracle of Forgiveness , 51). As he taught his readers how to defend themselves against spiritual wickedness, Paul drew upon the image of a soldier wearing armor (see also Romans 13:12; 2 Corinthians 10:3–7; 1 Thessalonians 5:8). Paul listed the parts of a soldier’s gear in the order a soldier would put them on or take them in hand. Symbolically this showed how the gospel protects a person’s overall spiritual soundness, including one’s thoughts, intellect, feelings, and moral purity. The following chart lists the pieces of armor that Paul identified and what they might represent today. “The stakes are extremely high. The prizes are the very souls of the sons and daughters of God, their eternal salvation. And these souls will be won or lost on the basis of virtue and cleanliness, on the basis of charity and service, and on the basis of faith and hope” (“Who’s on the Lord’s Side? Who?” Ensign or Liahona, May 2005, 49–50). “The plan designed by the Father contemplates that man and woman, husband and wife, working together, fit each child individually with a shield of faith made to buckle on so firmly that it can neither be pulled off nor penetrated by those fiery darts. “It takes the steady strength of a father to hammer out the metal of it and the tender hands of a mother to polish and fit it on. Sometimes one parent is left to do it alone. It is difficult, but it can be done. “In the Church we can teach about the materials from which a shield of faith is made: reverence, courage, chastity, repentance, forgiveness, compassion. In church we can learn how to assemble and fit them together. But the actual making of and fitting on of the shield of faith belongs in the family circle” (“The Shield of Faith,” Ensign, May 1995, 8). What have you seen Church leaders do to help accomplish the important purposes of the Church as detailed in Ephesians 4:12–16? In what ways have you been blessed by the service of Church leaders and teachers? As you consider the different pieces of the armor of God (see Ephesians 6:14–18), which piece do you feel is most critical for your life right now? What could you do to make sure that you are spiritually protected so you can “withstand in the evil day”? (Ephesians 6:13). Read Paul’s teachings in Ephesians 5:22–6:4 and make three lists: the responsibilities of a husband and father, the responsibilities of a wife and mother, and the responsibilities of children. How can the fulfillment of these responsibilities lead to unity in the home?